A star is a stellar object that emits energy in the form of radiation and electrical particles (electrons and ions). The wind of particles is called the « stellar wind » and, in the case of the Sun, the « solar wind ». In our experiment, we can connect either an electric duct (ie a simple metal tube), and / or one or two spheres to the négative pole of our generator (which is nothing more than a big electric battery, producing continuous current). In the description of the experiment, we call "a star" what is connected that way and delivers the electricity. A planet receives energy from its star, ie radiation and stellar wind. In our experience, we can connect either an electric duct and / or one or two sphères to the positive pole of our generator. 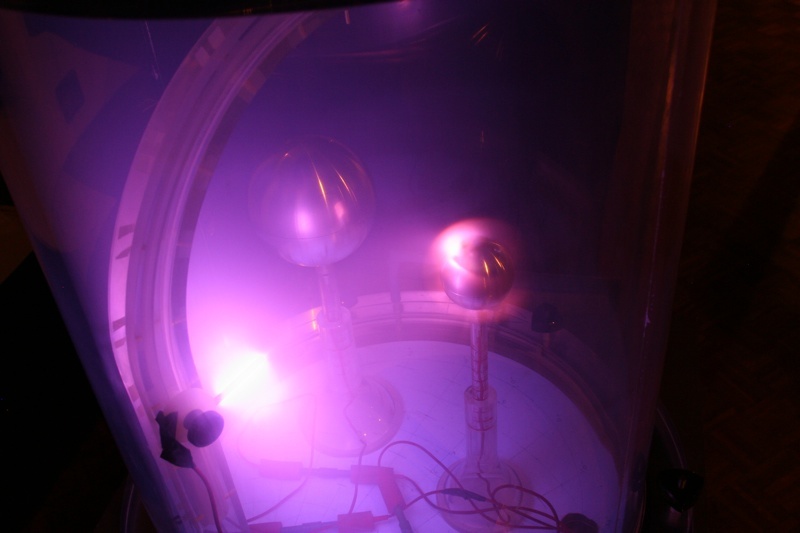 In the description of the experiment, we call "a planet" what is connected that way and receives the electricity. There are several configurations for the Planeterrella. We demonstrate some of them in the following subdirectories. There are several configurations for the Planeterrella. We show some of them in the sub-directories. On all the images, the magnetic configuration is as follows: in the center of the small sphere, there is a dipole magnet of intensity 800 mT. The north magnetic pole is located in the "north" of the "planet", and the South magnetic Pole to the "south", meaning that their axis is vertical. 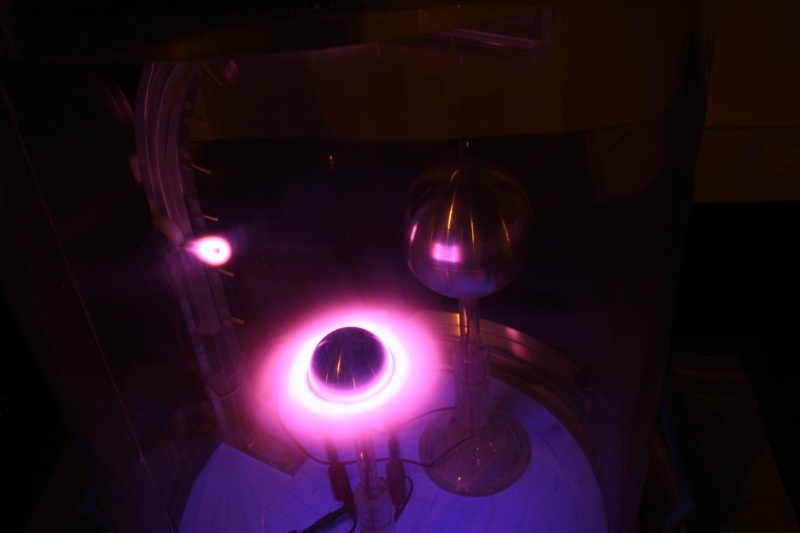 In the large sphere, there are two magnets, each of them with an intensity of 400 mT, but they are inside against the sphere. Their axis is tilted about 20 ° with respect to the vertical. It goes without saying that these configurations can be changed at will. A prediction made with the Planeterrella : the case of Uranus.